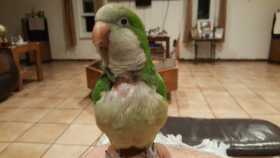 Buddy flew out at 9pm on 6/21/16 he followed my wife out side our lani. I had just checked on him in his cage, he was fixing up his nesting area. He had made a Quaker nest in his cage. We both believe that he was upset with us for something we did it didn't do. We miss him.